The Royal Doulton Bayeux Tapestry seriesware pattern was introduced in 1907, making it one of the first patterns to be launched. The pattern for these pieces is based on the embroidered tapestry that was created at the request of Bishop Odo, the half brother to William the Conqueror. Over 200 feet long and on display in its own museum in Bayeux, Normandy, the tapestry tells the story of the Norman conquest of England in 1066. At the end of the 19th century, Royal Doulton’s original art director, Charles Noke, was busy at work creating ideas for the launch of Royal Doulton’s new Seriesware range. Characters from literature, history, folklore and music were the inspiration for many of the new patterns. 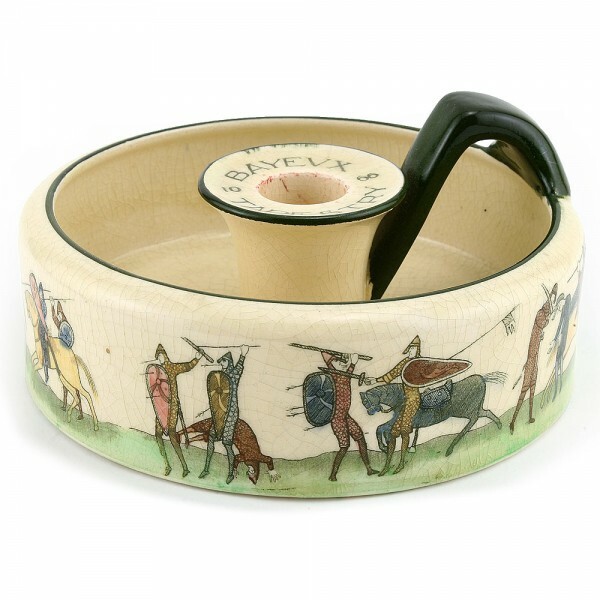 Popular sports and leisurely activities such as golfing, hunting and fishing were also illustrated on a variety of ware. Seriesware patterns featuring children are among the most collected today. The list of subjects is endless and demonstrates Noke’s inherent gift for creating items with popular appeal.